I know, stop talking and get down to business! I finished dress #12 of my 27 Dresses Challenge! A green halter dress which reminds me a lot of the Marilyn wiggle dresses and believe me, this dress is so tight – there’s a lot of wiggling! I used the #122A pattern of the Burdastyle magazine July issue. Besides all the wiggling, there’s some serious risk of wardrobe malfunction with this dress. 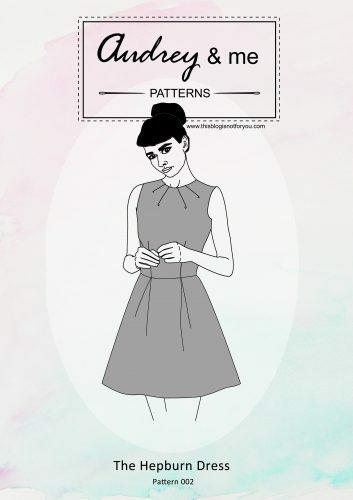 I was stupid enough to ignore the Burda instructions (like always…) and chose a stretchy, but obviously not stretchy enough fabric for making this dress. 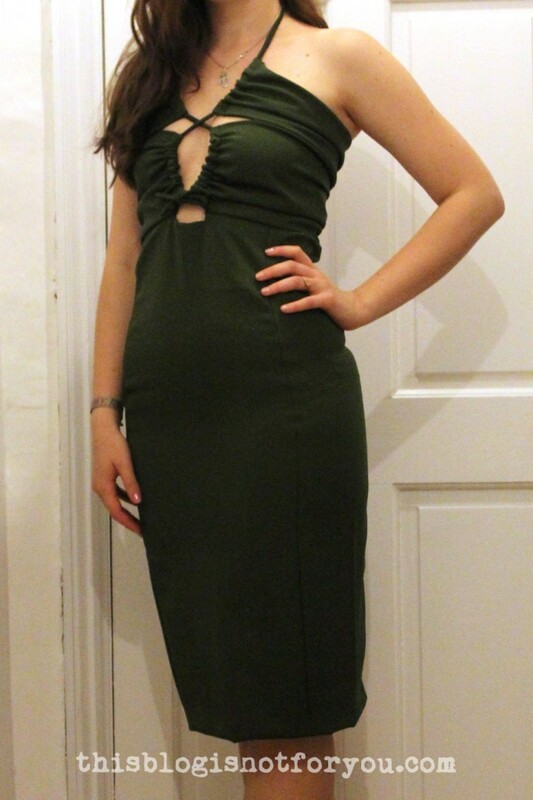 Now it’s not only super super tight, but I’m afraid I’ll never wear this dress outside our flat. Why? Look at this! It doesn’t look too bad in the picture, but in reality my boobies look like stringed ham on Christmas. The fabric of the bodice part of this dress is basically the wrong way up. Yes! Stupid! Why? I decided to cut out the fabric while watching a movie (distraction) in the living room (broken lightbulb). On the first look the fabric looks the same from both sides. If you look closer (which I obviously didn’t) you see that the fabric on the right side is slightly shinier than on the left. Where is Tim Gunn when you need him? A “This concerns me enormously” would have helped. Thanks, Tim. I’ll better not tell you that I sewed on the skirt wrong side up the first time, ending up with the raw edges on the outside. No, I better won’t. Bah ha ha! Tim Gunn is my “sewing conscience”- I hear his voice in my head when I’m doing something wrong! The dress looks lovely on you….I will believe you that the broken light bulb helps though. 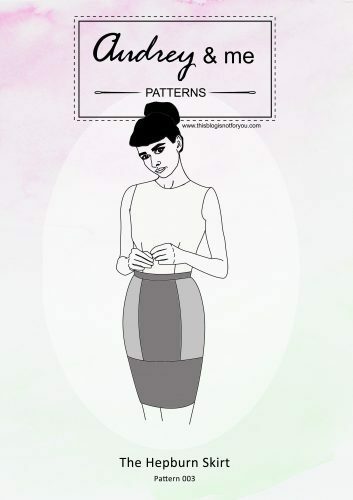 Just know that you look better in your wrong side out wiggle dress than most of us look on our best day:) and I’ve never been able to use a magazine pattern. Even if I mess up I feel okay as long as I learn something, and the design is lovely my friend! This is the dress you were telling me about! You look amazing in it and I am sure nobody else will notice that the bodice fabric is left side out (I for sure don’t). You might still be able to wear the dress on a party? Or together with a bolero that you close over the bust? And well done having finished the masters! Haha, thank you Daniela! The bolero is a very good idea! I hate when the outcome isn’t satisfactory! I’m sorry it happened to you. But your shoes are SUPER fab! Also, congrats on the masters!!!! Oh and I forgot to congratulate you on finishing your 27 dresses project! 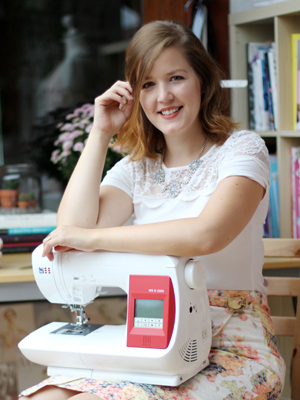 Will you be getting your overlocker now? Oops sorry, I guess I was so much concentrating on your dress I didn’t read that part properly. There is one and he loves everything I make,well, that’s at least what he says 😉 Thanks Hannah!